Military veterans play a central & invaluable role in the antiwar movement, not just in the US but in the UK & other countries. 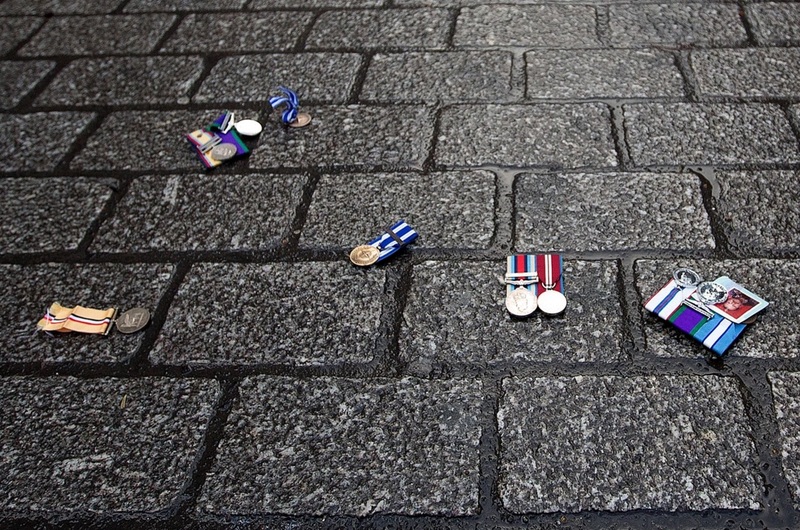 The photo is of war service medals discarded by veterans at a recent protest against UK intervention in the Syrian war. 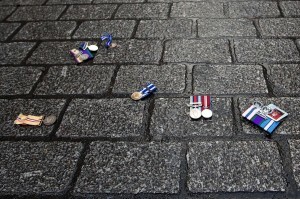 The gesture of veterans discarding medals became prominent during protests against the Vietnam War, which was an international movement involving millions. John Kerry, who rose to prominence grandstanding against the Vietnam War, now shills for US wars as secretary of state. He once publicly claimed on TV that he discarded his several medals at the April 1971 march of over a million people in Washington, DC. Since his political career as a senator in 1984, he began to admit he still has the damn things & only threw out his ribbons. He was always a lying-assed weasel & has the perfect job for his character. Our hats off to these veterans & to the UK antiwar movement. Rebuild the international antiwar movement. It used to be so much fun to ridicule Trump because his politics seemed improvised from narcissism & idiocy. He clearly understands nothing & knows less. But now we see that under that foolish head of hair is a cesspool of racism, xenophobia, & reckless social hatred. Combined with his stupidity, it’s a boiling potpourri of horse manure. But he does have a political program & it is very dangerous indeed. So he’s not funny anymore & memes that focus on his idiocy should be replaced with images of a horse’s rear end. When we google “Trump” we should get his real portrait. Which flatters him.